Butter a 22cm square tin and line the base with edible rice paper. Put the sugar, honey, glucose syrup, salt and water in a pan, bring to the boil and cook until the temperature registers 122C on a candy thermometer. When the syrup is almost at the correct temperature, start beating the egg whites until they are very stiff. With the motor of your mixer running, pour 1/4 of the syrup onto the egg white whisking continuously Return the remainder of the syrup to the heat and continue cooking it until it registers 157C. Pour the remainder of the syrup in a thin stream onto the egg whites with whisk running continuously. Add the roughly chopped butter and vanilla then beat for a further 5 minutes. 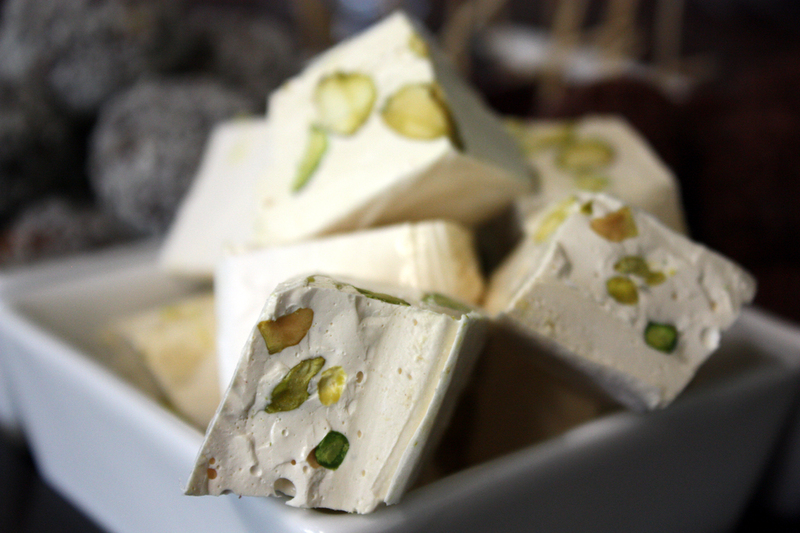 Stir in the pistachios by hand, then pour the nougat into the prepared tin. Press hard and quickly to flatten the surface then press a layer of edible rice paper on top.